A loud, unstable washing machine can trigger many home owners to question whether its time to acquire a new machine. Fortunately, that increased sound and motion is frequently caused by a problem that’s simple to repair. To help you find the issue behind your shaking device, our leading appliance repair professionals have gone over 3 typical problems, listed below. When your dirty clothing gets bunched-up in your washer’s tub, an imbalance in your device’s rotation can take place. Sadly, an out of balance rotation might trigger your washer to shake frantically. To prevent this problem, just spread out your laundry equally prior to starting a cycle. However, if you see your device shaking in the middle of a wash cycle, stop it right then and re-position the damp clothes inside the device. When the laundry is correctly spread-out, your washer shouldn’t trigger a mini-earthquake in your house. If your washer isn’t leveled effectively, there’s a chance it’ll probably experience violent rocking as it cleans your clothes. Installing your washing machine on a durable flooring, such as concrete or wood, can help prevent leveling issues. Unfortunately, putting your device on softer flooring can make a level washing a bit more complex. To find-out whether your appliance is in need of adjusting, merely put a leveler on top of your washer. Make sure you measure the level for front to back and side to side. If your washer needs a readjustment, consult your owner’s manual for comprehensive directions on the best ways to adjust the level on the bottom of your particular washing machine. The shock absorbers in your washer help to lessen the vibrations triggered by the device’s spin cycle. If your washer is shaking more than normal and you’ve gotten rid of an out of balance load or a leveling mistake, the absorbers are the next likely suspect. To find out if this is really the issue, it’s best to give the appliance repairmen of AWG Appliance Repair a call and we can help you get down to the bottom of your problem.. If you’re worried about your washer’s efficiency, please call us today and we’ll be more than happy to assist you. We’re proficient on Samsung, Whirlpool, GE and numerous other significant home appliance brand names on the marketplace today. Our experts are trained straight on your brand of device a number of times each year. 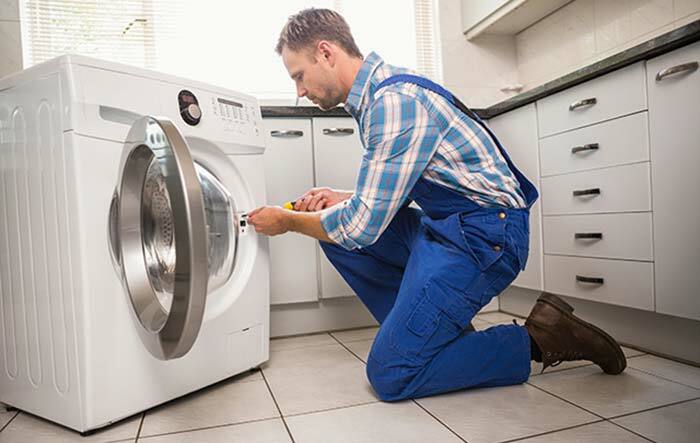 Contact the professionals at AWG Appliance Repair today and get your broken washing machine fixed!.